INDIANAPOLIS – Eastern High School senior basketball standout Brittany Neeley is receiving the “Shelbourne Knee Center Student Athlete of the Month” award by Fox Sports Indiana March 22nd at Bankers Life Fieldhouse. Each month Fox Sports Indiana recognizes one high school student who has had success in sports, academics, and other activities. Fox Sports Indiana TV personality, Brooke Olzendam, will share the senior’s accomplishments during an interview with Brittany who will receive a plaque during the televised award ceremony at half-time of the Indiana Pacers vs. Milwaukee Bucks game. Brittany’s sister Bethany will also join the interview. This can be seen on Fox Sports Indiana. Brittany and Bethany were named the 2012 co-Female Athletes of the Year by the Sports Journal of Central Indiana. 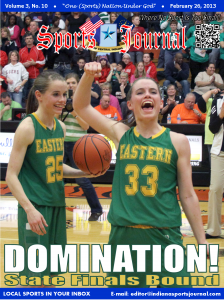 Brittany helped guide her Eastern Lady Comets basketball team to the IHSAA 2A State Championship Game during the Month of February. Brittany averaged 27 ppg, 13.1 rpg, 5.2 apg, 3.1 spg in the Lady Comets’ 6 post season state tournament games. Brittany set an IHSAA semi-state game record by scoring 48 points and grabbing 20 rebounds in the Eastern Lady Comets semi-state game victory over the Ft. Wayne Bishop Luers Knights on February 23rd. Brittany averaged 19.2 ppg, 8.9 rpg, 5.2 spg, and 4.5 apg this season as a senior while helping lead her team to the IHSAA 2A State Championship Game. Brittany became Eastern’s all-time leading scorer this season and finished her career at 1,341 points (ranking her 11th all-time on the girls Howard County list). She was named the area Most Valuable Player by the Kiwanis Club of Kokomo, was twice named the Indiana Basketball Coaches Association/Subway District 2 Player of the Week. and she was invited to the prestigious Hoosier Basketball Magazine Top 60 Workout. Brittany is a multi-faceted athlete who will continue her education at Indiana University on a track and field scholarship. Brittany is a state qualifying athlete in 3 sports, member of the school’s National Honor Society and 10 year 4-H member, and maintains a 4.5 GPA on a 4.0 weighted scale. Kokomo, Ind. - Playing their first and only home outdoor match of the season, Cougars dropped the contest 6-3 against a strong warrior squad. Kokomo, Ind. - The IU Kokomo Baseball Team returned home after their longest road stand of the season in dominant form as the ran away with the game Tuesday evening. Florence, Ind. - The record-setting 2018-19 men's golf season came to a close on Tuesday at the Belterra Resort in the River States Conference Championship. Here's how Houston's superstar has transformed his game since the lowest moment of his career. Toronto moves ahead in its series, while Calgary's run has ended. Winovich stops at nothing in search of growth and self-development, taking the Michigan DE to places many draft prospects wouldn't think to go. Auston Matthews broke a scoreless tie in the third period, Kasperi Kapanen added another goal and the Toronto Maple Leafs hung on the beat the Boston Bruins 2-1 Friday to take a 3-2 lead in their first-round playoff series. Jaylen Brown scored 23 points and Kyrie Irving added 19 to help the Boston Celtics beat the Indiana Pacers 104-96 on Friday night for a 3-0 lead in the first-round series. Strong storms were still roaring across the South on Friday, after killing two Mississippi drivers and a woman in Alabama and leaving more than 100,000 people without power across Alabama, Mississippi, Louisiana and Texas.